Doxygen doesn't incorporate all member files but just a definable subset (basically the main project source code files that are written in a supported language). So to search and browse all member files you may visit the Fossies gambas-3.13.0.tar.bz2 contents page and use the Fossies standard member browsing features (also with source code highlighting and additionally with optional code folding). 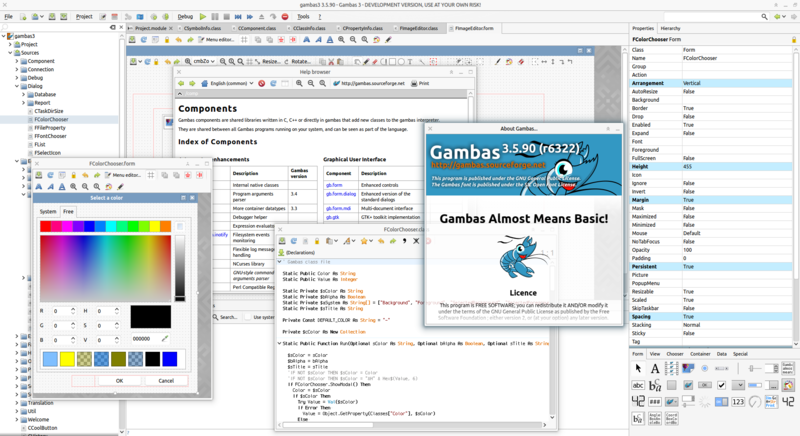 GAMBAS is a free implementation of a graphical development environment based on a BASIC interpreter and a full development platform. It is very inspired by Visual Basic and Java. Go to http://gambaswiki.org for the language documentation. The natural string comparison algorithme was adapted from the algorithm made by Martin Pol. See http://sourcefrog.net/projects/natsort/ for more details. The hash table implementation was adapted from the glib one. The HTML entities parsing in gb.gtk comes from KHTML sources. The gb.image.effect sources are adapted from KDE 3 image effect routines. The gb.clipper library embeds the Clipper library. See http://www.angusj.com/delphi/clipper.php for mode details. The function that computes the easter day of a specific year uses an algorithm made by Aloysius Lilius And Christophorus Clavius. The blurring algoritm is based on the 'StackBlur' algorithm made by Mario Klingemann. See http://incubator.quasimondo.com/processing/fast_blur_deluxe.php for more details. If I forget some borrowed code in the list above, just tell me.